Do you use Twitter? If you’re reading tech blogs, I’m guessing you probably do. If you’re just a personal tweeter then you won’t need a service like Hootsuite, but if you run a small business or an personal projects it can become invaluable. If you run a small business then it’s advisable to have a Twitter account. For a very low amount of marketing effort, you can catch the eye of consumers that you wouldn’t otherwise reach, and if your twitter feed is clearly targeted to a certain market, you will pick up followers who are interested in exactly what you offer, creating a tailored sales channel. On the other hand, if you are an ambitious professional. It also makes sense to have a personal Twitter account, allowing you to build your brand as a thought leader in your field. How to manage both of them? The first service that Hootsuite or similar sites, such as Tweetdeck, offer is a simple one, but probably the one that adds the largest value. Without a place to access more than one feed you would need to log out and in again every time you wanted to look at a different account. With Hootsuite you can stay logged into your main Hootsuite account and then access all feeds, in a similar way to the Google multiple sign-in feature for emails. Then there are services that are invaluable if you are a busy business tweeter rather than a casual personal one. You can send the same tweet from multiple accounts. You can schedule tweets so that they appear in your timeline at a later date (perhaps while you are busy in a meeting!). You can even auto schedule tweets to appear when they will have the maximum impact on your followers. Hootsuite is free to use if you want to access fewer than 5 twitter accounts, which should be enough to be getting on with for most people. This post first appeared on Zoe Cunningham’s blog. I’m pretty sure that, like me, you don’t remember the first time that you used Eventbrite. When I first came across it, it felt like one of among a million new startups to do something that it seemed sensible to have a web app for. It felt like a nice site that did what you wanted, but would they ever make money just from selling tickets? The competitors that Eventbrite started out against were the big boys – Ticketmaster, Ticketweb and individual venue and event organiser sites. As a consumer buying tickets, I couldn’t see how tiny Eventbrite could end up a winner. But Eventbrite had a better plan. They weren’t trying to compete with Ticketmaster to sell Madonna tickets. They were going for a previously unserviced market – small independent events organisers. In fact I would suggest that Eventbrite in fact helped to create this market by allowing event organisers who couldn’t afford large system licence fees access to a simple pay-per-ticket cloud platform, and hence the ability to run events that wouldn’t have happened otherwise or to grow attendance of smaller meetups. Eventbrite is completely free to use if you are not charging for your tickets, and they charge a percentage (which can be either deducted from your revenue or charged through to the ticket buyer, as you prefer) on paid-for tickets. I’m writing a series of 5 posts on what I consider to be the best free web applications available at the moment. You can read the last post about free emailing application Mailchimp here. It is with great delight that I choose Weebly for my second best free app. This is in a large part because if you are reading this on my personal blog (http://www.zoefcunningham.com/blog.html) it is being brought to you by Weebly! (Similarly if you are subscribed to my blog, the you were delivered the last post about Mailchimp via Mailchimp!). As a coder, I wrote and designed my first website myself, from scratch. Big mistake. I am a coder, not a designer. My website looked truly appalling and had that hint of “is this a hoax site? It’s so badly designed” about it. It was so bad, I wish I had taken a screenshot of it to show you. My second attempt involved using someone else’s design but editing the HTML directly myself. This seemed like the perfect way to get maximum flexibility (WYSIWYG was a dirty word 10 years ago) with a sensible amount of effort. But was it a sensible amount of effort? Editing my website became a massive chore. I was using a simple file sharing site, and so to make an edit I had to download the HTML, make an edit, test locally, upload it and then fix the typos that inevitably occur. That’s leaving aside the fact that “make an edit” involved typing out more characters in HTML tags than in text. I have used a lot of WordPress sites, and I find them too to be difficult and non-intuitive to use. So I was absolutley delighted to discover Weebly.com, (found by typing into Google something similar to “website designer”) which I now use for all of my websites (8, in total). 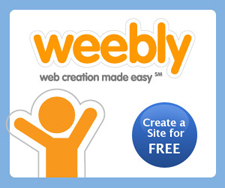 Weebly solved all of my website problems. For each website I can select from a range of templates that are simple, clean and professional looking. Each site looks different and you would not guess that a site builder was behind them. I have even been complimented on the design! I can easily edit my site to add text, pictures and audio and video. Sometimes I cannot set the layout exactly as I would like, but I can always get something that looks reasonable. I can add custom HTML for when I want to add widgets from Mailchimp or Mixcloud. Whenever I try to find a way to do something I haven’t done before (e.g. adding an extra author for a site), there is always a sensible way to achieve it. In fact, despite starting with Weebly because it was free, I quickly upgraded to the professional version in order to use my own domain names (the biggest limiation of the free version is that you must use <your-site>.weebly.com). For me, that is the perfect example of how good these new free web applications are – you’d be prepared to pay for them if you had to. I recently gave a talk at the City Business Library on how to get your software to work for you (rather than the other way around!) and one of the key parts of my talk covered how much amazing quality free software there now is available.More and more professional web apps are attracting users by offering a free entry level package allowing the small business user access to a subset of features, or limited usage. Because these sites hope to turn you not a paying customer one day, you also get a professional level of service, unlike the “made in a bedroom” class of apps that have sketchy support at best. It was quite difficult to pick my top 5 and I’m sure I’ll keep adding to the list as new apps come on the market. The notable similarity between all of these apps is that they all do only one thing, and do it well. MailChimp is free to use for up to 12,000 emails a month if your mailing list is under 2,000 users. Above that a monthly charge applies, but, like with all the free software options that I’ll be writing about, hopefully by the time your list gets that big you’ll be making enough money to afford it!